There are basically three different types of shelters suitable for hunting purposes. Wall tents, tipis, and tarps. For the aspiring back country hunter, the tarp will likely be the first to be purchased. Your individual needs will decide if the wall tent or tipi will be next, but we do recommend starting with a tarp. 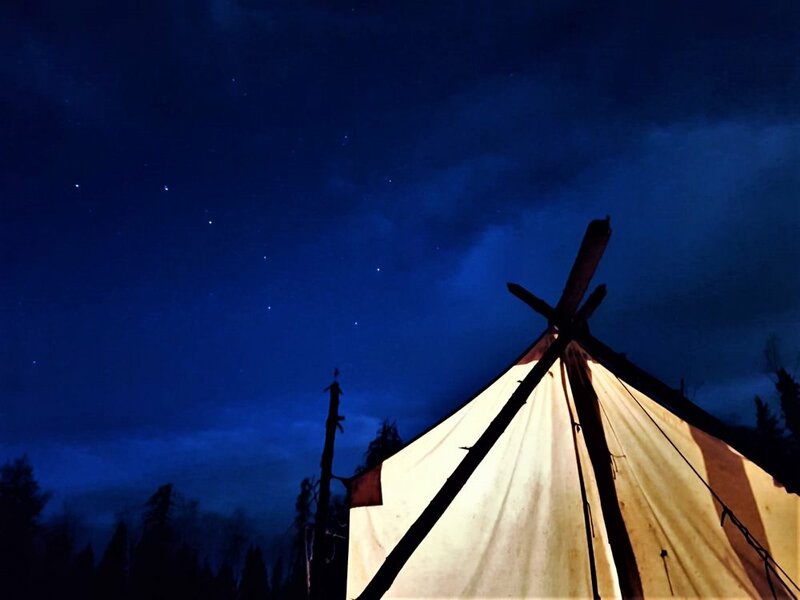 Those hunting late season, using a vehicle to mobilize from a base camp would be best served by a wall tent, while the more dedicated nomad would be better served by a tipi. Ursa Major in the background of a 10x12 wall tent that sleeps 3 plus gear and stove, in an ATV mobile spike camp Fall 2018. Our “River Base Camp” October 2018. A 12x14 wall tent that sleeps 3-4 plus stove, and a 10x12 tent for cooking. Few things stir up the feelings of nostalgia quite like the traditional wall tent. These tents are the old dependable work horse of the west and have been around a very long time, with good reason. We have tried to go without wall tents and use lighter, more packable options but for an established base camp in place for 5 days or more, they are absolutely our first choice. In our opinion, when using wall tents the only way to get the most out of it "strengths" is with the internal truss frame. The external log frame and the internal "3-pole" design are alright, but it is our opinion that if weight and pack size is that important, a tipi/bell/pyramid may be better suited for the task at hand. Our base camp utilizes a wall tent with the internal truss frame and is left set up for 3-4 months of the year, mostly unattended. Using shorter then normal poles, adding an additional set of angles, as well as a center support pole, our tents survive massive snow loads without issue and are confidently left unattended in all weather conditions. Wall tents are also the most practical for larger groups of people and longer stays as they have excellent head space, do not feel cramped, and offer the most comfortable living conditions. Pictured is an extremely high quality tipi tent available from Kifaru. A 12 man tipi has plenty of room, and is light relatively light weight. Three subtypes of what is essentially the same design, these tents use a single pole in the center of the tent to erect the main structure and then employ many guy out points to add additional volume and living space inside. We feel that these structures really shine when they are kept smaller in size, ideally suitable for two people plus gear, possibly a 3rd in a pinch. These tents can seal out wind and weather exceptionally well, be easily packed, and set up reliably in the dark. We have used a number of tipi/pyramid tent styles and have found some shapes poorly circulate heat to the edges in extremely cold temperatures. This does not mean they should not be used in cold climates, just that care should be taken around the outside with regard to condensation and freezing. Military arctic 10 and 5 man tents have a short wall around the outside of them, which alleviates many of the problems of heat circulation, but these tents are not constructed with materials suitable for packing in groups smaller than 5. There are a number of different tarp designs out there. Specially shaped "wings" and other designs improve the ability to seal out wind and weather, increase head room, and hold in heat. Regular rectangular designs are extremely versatile and can perform a number of tasks aside from being a shelter. We love to use tarps in the early season and historically have even employed them into the extremely cold Canadian winters in a variety of survival shelters. We feel tarps (often combined with a bivvy) give the most immersive experience possible with the wilderness. Four to five guys can each set up around an open fire and feel the heat, see the stars, and enjoy the conversation. The tarp is my personal favorite, in all seasons. Use this form to get in touch with us about shelters.